PanARMENIAN.Net - Low-dose aspirin use does not seem to reduce the overall risk for prostate cancer death at the population level. However, results for extended exposure periods suggest that low-dose aspirin might be inversely associated with prostate cancer mortality after 5 years from cancer diagnosis. Findings from a nationwide cohort study are published in Annals of Internal Medicine. Recent studies suggest that aspirin use may improve survival in patients with prostate cancer, but study results are inconclusive, Science Daily says. 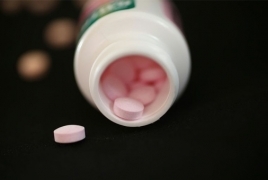 Researchers from the Danish Cancer Society Research Center, Aarhus University Hospital, Copenhagen University Hospital, and University of Southern Denmark used nationwide registries in Denmark to assess the association between postdiagnosis use of low-dose aspirin and prostate cancer mortality. Their analysis did not find convincing evidence of an overall protective effect of low-dose aspirin for men with prostate cancer. However, they did find a reduced risk for prostate cancer mortality with low-dose aspirin use among patients with low Gleason scores, meaning that their prostate cancer was unlikely to progress, and among those who took low-dose aspirin for an extended period of time. The authors of an accompanying editorial from Tampere University and Tampere University Hospital in Finland speculate that improved prostate cancer-specific survival among aspirin users with low Gleason scores might be explained by inaccurate tumor grading occurring less frequently in aspirin users than nonusers. Aspirin is an anti-inflammatory drug that lowers serum prostate-specific antigen levels; however, whether this leads to accurate determination of tumor aggressiveness in aspirin users remains to be determined in further studies, according to the authors. They suggest that future research evaluate aspirin exposures longer than those studied to date and investigate the effects of aspirin exposure on disease classification.